Favorable opinions of both business corporations and labor unions have rebounded from record lows reached in the summer of 2011. Public views of business corporations and labor unions, which had mostly been in positive territory from the 1980s through the early 2000s, turned less favorable during the economic recession. And in August 2011, amid fears of a new economic downturn and widespread dissatisfaction with national conditions, favorable ratings for business and labor hit all-time lows. Since then, favorable opinions of business corporations have increased 17 points and positive views of labor unions have risen 10 points. The national survey by the Pew Research Center, conducted June 12-16 among 1,512 adults, finds that favorable opinions of business corporations have increased by double digits across all partisan and ideological groups, with one exception. Liberal Democrats are no more likely to view business favorably today (37%) than they were two years ago (35%). Views of labor unions also have improved across most groups since 2011. However, Just 23% of conservative Republicans view labor unions favorably, which is virtually unchanged from two years ago (24%). The ideological divide in opinions about both labor and business, already wide, has increased. 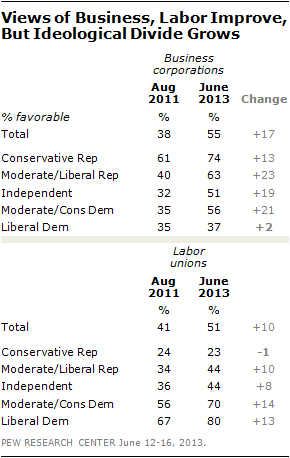 Fully 80% of liberal Democrats view labor unions favorably, compared with 23% of conservative Republicans. And conservative Republicans are twice as likely as liberal Democrats to have a favorable impression of business corporations (74% vs. 37%). The overall improvement in views of both labor and business is consistent with the history of these two measures moving in concert. In five Pew Research Center surveys conducted since 2002, no more than four percentage points have separated favorable views of business and labor, and ratings for both have moved up and down in tandem. Throughout much of the 1990s, business corporations were viewed somewhat better than labor unions, but over the past decade both have received comparable ratings. Opinions about business corporations and labor unions also vary widely across demographic groups. Men are more likely to view business favorably (56%) than labor (46%). Women are about as likely to hold a positive view of business corporations (53%) as labor unions (55%). Those under 30 are the only age group in which a majority (61%) views labor unions favorably. Older age groups are more divided. There are more modest age differences in views of business corporations. Household income is also a factor in these views. By a 59%-44% margin, those earning $75,000 a year or more take a more positive view of business corporations than labor unions. Among those in household earning less than $30,000 a year, labor unions (56%) are viewed at least as favorably as business corporations (50%).